Very sturdy on windscreen and magnet is great. I’m a truck driver and have had a few phone holders but this one is by far the best yet. Received today, installed in minutes - Went for a drive (inc a bumpy drive too) to test it out and the phone never moved at all! Extremely easy to attach and detach the phone. Easy to install and works a treat. Thank you. This is the best design of mount. I have bought three of them, one for each vehicle. This magnetic holder is a great bit of kit. No vibration movement of the phone whilst traveling, easily applied and holds really firm. Highly recommended for using your mobile for navigation 10/10. Holds the phone perfectly and works really well. Other holders I've had kept falling off the window, the suction cup wasn't great but this one is excellent. It is good idea for a phone holder, but it does not work with my phone. My Honor 8 has a glass on the back. The metal plate, which comes with holder get undone each time I want to detach my phone from holder. It stays in place only because of mu phone case. I tried to put stronger double tape on metal rectangular plate, but still no good. By the way, the amount of tape on rectangular metal plate, which comes with holder is ridiculously small. That is why I am giving only 2 starts. Love this product as it works exactly as I'd hoped. Perfect! I was worried about the heat and how the mount would hold- after a week of 90+ degrees, the mount is as sturdy as the day I installed it. Easy to use, easy to remove my phone. I spent a lot of time looking for the right cell phone holder and am very happy I selected this one. I am sorry I can not review at present as I had it delivered to my friend in the UK, unfortunately his trip is postponed so I will not get my hands on the phone holder until later in the month. The web site told me everything I needed to know. Love it! It works wonderful! Recommended! Thickness of phone case could affect magnets if putting them inside and not sticking on outside. I've used this now for a week and I'm really impressed. The suction is really sticky to the screen and hasn't slipped at all. The magnetic side of it is really well designed. I've used it by fitting the thin magnet inside the phone case which doesn't bulk it out and it does hold it, again with no slipping. I did try it on my dash and it did fall down but that could've been my own fault. Overall this is a great holder at a very good price. Works extremely well - should have got one years ago! This has worked as a charm for our family. Purchased one for each of our vehicles...both my wife & I use them all the time! I bought this as my other holder got lost. I chose this after reading other reviews and so far have been very pleased with it. The actual windscreen mount is one of the strongest I have come across, it really does stick to the window, and does take a bit of effort to remove it when changing vehicles. The magnet does its job, in fact on one occasion the magnet stayed on the mount when i removed the phone from the holder and I had to re-attach it to the back of the phone. Maybe that was my fault. On the whole a great bit of kit and yes I would recommend it. Got this after the vent Olixar did not work for my corse beacuse the vents are too weak to hold it up; so i got this to try on the car's windscreen or dash. the couple of times i have used it works good and i can access the phone to change music or answer a call without looking down at the phone like i did before. therfore safer. just need more time to really see if it works longe term. Super strong magnet and sticker - easy to install and holds the heavy iphone 7plus with ease - can now use my phone without it flying off the dash every 5 minutes - should have bought one years ago!! Delivery was within 24 hours of order - v impressed. I have tried numerous phone mounts to date. They have been too cumbersome, not held phone securely, awkward to use or, if mounted on the dashboard they required a oart to be glued on. This new obe, though, is fantastic. You can literally mount it anywhere and it stays put. Also, removal is easy, clean and quick. I am considering buying more to give to my family as presents. After using many different types of dash mount, decided to try a magnetic one. Glad I did, as it holds my S7 (in a Case Mate cover) firmly without wobbling, and the roads around where I live aren't exactly smooth. Easy to apply the base to my dashboard, and the phone is easy to place, and remove. I have found the smaller round pad works better than the larger rectangular one, but it still holds well. so far I am happy with this product as it has done what it says. Sorry to hear you are not happy with this item. Can you please let us know exactly what the problem is so we can look into this for you. As you can see from other reviews, this is rated very highly typically. This phone mount is just great so easy to put on and take of mount but phone would definitely not fall off. I would recommend this item. Compact, light, will stick to practically anything. Best feature is ability to use my mobile phone as a dash cam. This mount is fab. It has the newer vacuum sucker on which means it can be attached to the dash (embossed surface) and even on curved areas. I put mine on a reasonable sharp curve and there's no wobble to speak of and it's holing in place well with an iPhone 7 Plus so a large phone. I had tried one from elsewhere but the magnet was very poor and did not hold the phone securely. The Olixar secures the phone well. Adheres to surface really well and the magnetic head is strong, holding phone, satnav etc yet items can be removed easily. Definitely recommended. Spent a long time searching the internet for a product that would allow me to use my phone as sat nav, previously products not been strong enough to hold my iPhone 6 Plus or had fiddly buttons to release the phone! This product looks much neater on my windscreen and is virtually covered once my phone is in place. The sucker also has a gel like material so no need to wet it to stick to the windscreen. This not only stops the swirly marks but has a great hold. I have the magnetic provide (2 magnets included) between my phone and case as didn't want to permantly stick this to my phone and it holds really well, it does need to be firmly fixed though as the magnet will move if not attached securely. Would highly recommend this product. Great price too! Dose what it is supposed to do. I am fully satisfied with the product and will be recommending it to friends and family. 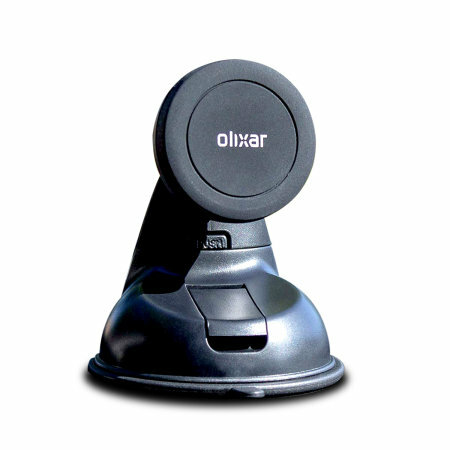 The Oliver Magnetic Windscreen Mount is great. It is small and compact, a big bonus. But the magnet system even holds my large Huawei Mate 8! And it is so easy to attach and unattached your for with the magnets! Perfect. A really good product, holds my phone easily and extremely easy to use. I like it a lot. Really good product, very easy to use and practical. Mobile fun as usual quick delivery and a perfect product as described on the website. As the new law for not using phone whilst driving this is perfect to put on the dash right in front of you to use gps/sat nav. The mount sticks on perfectly without falling off. It is magnetic and in my opinion its better than most windscreen mounts. I would reccomend this to anyone looking for a mount for phones. Good delivery. Does the job as reported. Does just what it says on the box. A very useful gadget to securely hold any device - phone, satnav whatever. Easy to fix and use. Items can be readily attached and removed and while attached can be rotated to any desired position. Thoroughly recommended. Searched for a long time to find an easy fit that doesn't wobble. Excellent well made solid product. Search over! Absolutely brilliant car phone holder. My dash has a stippled effect but the sucker adhered perfectly first time and has not come off as yet. Both the magnet and sucker both stick ridgedly to the dash without wobling or moving whilst going over speed bumps etc. Great quality product I was so happy I bought another one. Great product & customer service from this organisation will definately be ordering more products from them. The product & service was first rate, will be ordering more products from this company which i've done in the past. The product performs exactly as described. I've only had it less than a week at this point but no issues with the mounting. I was worried about the magnet not fitting under the backplate of my phone however that was a non issue. I do have a couple of issues with this however. One, which could be easily improved on has to do with the windscreen clearance. If you have a decent sized phone you may need to have the magnet slightly above center for it to fit. In that case using the keyboard at the bottom of the screen (pushing) may cause the phone to fall off. Another major problem I had was that the magnet seems to affect the GPS signal of my phone. Since navigating was the main reason I decided to mount my phone on the windscreen it is very frustrating. I'm going to play around and see if I can get around this somehow. This is by far the best mobile car holder. It works by a simple magnet attached to your mobile or to a case. The base sits on the dash board comfortably and when the mobile is attached to it its very sturdy even on bumpy roads. There is no faffing about trying to get it into a spring bound cradle you just slap it on the base and you are ready to go! Fantastic product it does what it says it stays where it should and holds my phone perfectly no matter what very reasonably priced buy this you won't regret it. Sorry to hear you are having problems with your item. Please ensure the magnet is not blocked out by a large case and that the nut on the holder is tight. Car holder fixed solidly to the dash of the car, small metal disc fitted to the inside of the phone cover via a adhesive patch. Easy to now mount the phone securely and rotate to view in portrait or landscape very easily. Made up with this purchase. Not sure designers adequately considered the potential adverse affects on wireless chargers. The metal stick on disks clearly modify the magnetic field coupling to the coil in the phone back cover, therefore the magnetic coupled charging function is adversely affected. Don't know if the designers considered this type of charger when designing the product. It will work fine as far as holding any phone. This struck me as being a great product, most vehicles have that bobbely plastic that you cant fix a suction cup to. so for the first type I got it stuck fast (really good) but removing the phone put a lot of strain on it. this one sticks just as good but has a magnet holder which can rotate the unit great for the navigator. Two metal tabs for the phone one can go inside your case the other type sticks to the outside of the phone. good but it depends how sticky the metal tab is. Overall a great product. What a great phone holder! I bought the device so I could use my phone as a Sat-Nav. It was easy to put on the dash and the phone just attaches straight on like glue with the magnet in the phone case. Unfortunately I discovered my company phone has no 3G..... But I know that when I do find my way home my phone will still be on the dash! It's seems a very effective at keeping its suction. Also highly effective at keeping the mobile device secure. And also very iOS value for money. However strange as it seems, the circular adhesive plate supplied had been used! So not an option for me to try this method. This product is perfect for my car (Ford Fiesta) Mounts in the centre of the dash where many others struggled to maintain a grip. The only downside is that the metal tag that inserts inside a case, to enable contact with the magnet, blocks the wireless charging (and NFC) while the phone is in the case. It's not a major issue for me as I don't find it a hardship to connect a cable, but it may be for some. The phone is easy to place and remove with no effort required, yet it holds solidly during journeys.